For express shipments after 12:30 p.m. Eastern time Mon-Fri. please call 1-888-496-6383 to ensure prompt delivery. When a pet dies, it is natural to want to honor him or her with a proper burial. We understand that pets are members of the family, and laying them to rest is an important part of the grieving process, and gives a sense of closure so that the pets' people can begin to heal. We want to help. 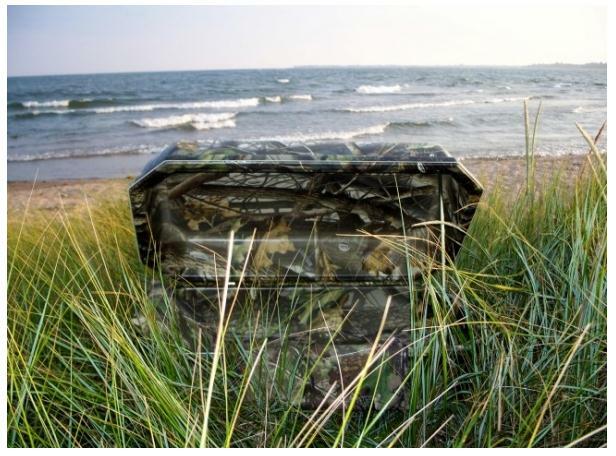 The Hoegh Nature Series features the Realtree Hardwoods Green® camouflage pet casket, built for lasting durability and quality. This pet casket comes with no interior. All units are constructed of strong, high-impact styrene. The design and special sealant restrict seepage of water and the intrusion of air. Hoegh pet caskets are capable of serving as a Casket-Vault combination. Length - Measure from tip of nose to base of tail. Width - Measure from the knees to the top of the back. Height - Measure from outside of shoulder to outside of shoulder. Below is a list of species of animals and/or breeds of dogs that this particular casket may fit well. This list is a generalization for your assistance; please measure your individual pet for best casket fit.